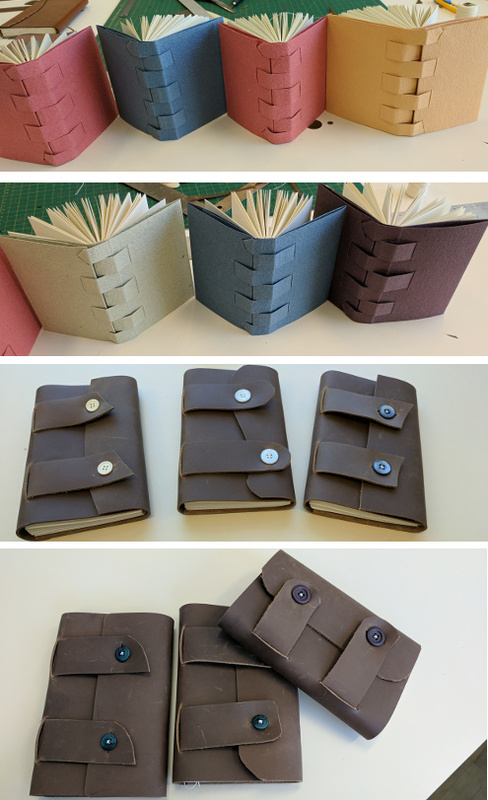 To kick off the new year, I have two weekend workshops coming soon at the Nova Scotia Centre for Craft. First is Feb 9-10, when you can learn about the Early Coptic books, also known as the Nag Hammadi books. 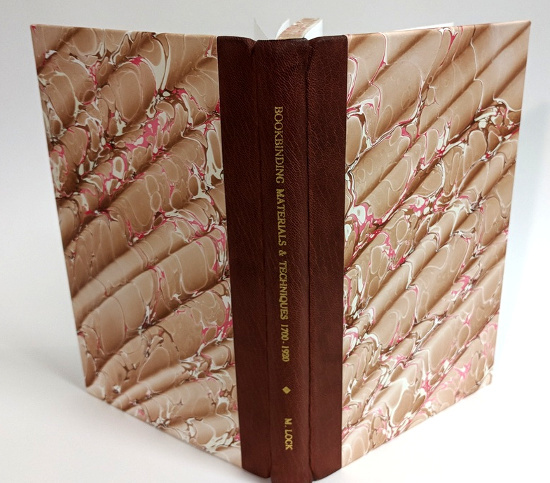 Second, is March 9-10, where you can spend the weekend immersed in the intricacies and elegance of Japanese bookbinding. Visit the Nova Scotia Centre for Craft website for registration and for more information about these workshops and all the other workshops they are offering this winter. 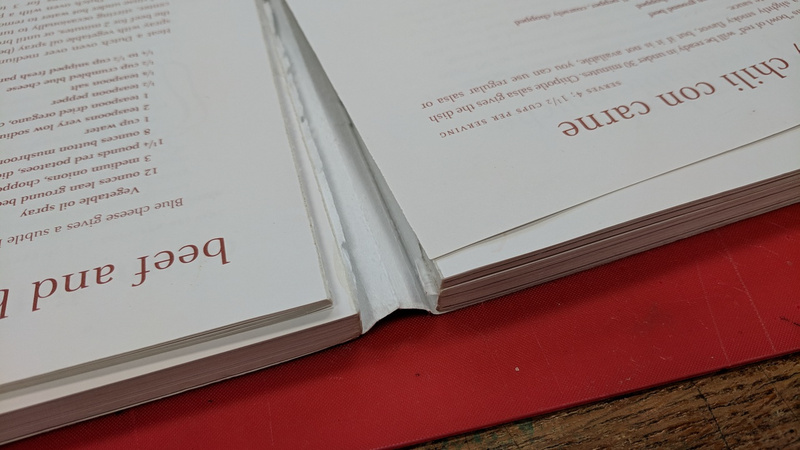 We started by taking our books apart and removing as much of the old glue as possible and the pages have to be grouped into sections for sewing. 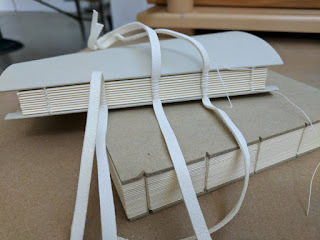 We sewed our textblocks onto flat linen sewing supports as per so many other binding methods. The main difference was the extra whip-stitching used to bind each section of pages. 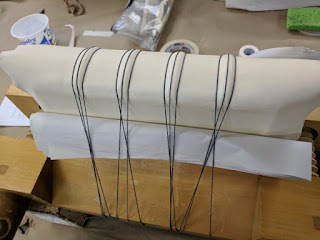 It is not a pretty sewing. That was the hard stuff. 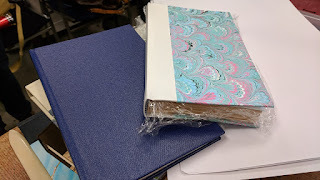 Then it was just a matter of rounding and backing, constructing a case and casing-in like any other case binding. Most of the students in my class had some bookbinding experience but one of the students had never bound a book before and hers turned out beautifully, as did all the others! 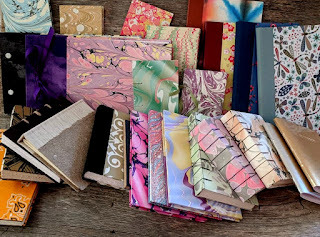 Most were quarter cloth with marbled paper, and one was bound in full cloth. The blue book in the next photo is the one made by the first-time binder. Pretty impressive. And she marbled that paper herself too! These ones even got the titles on the spine, which is a nice touch. And here's the full cloth version, and another of the quarter cloth with marbled paper. Very impressed with all their finished books! 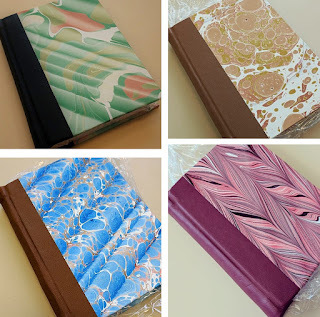 There are a few specific bookbinding books that I would like to acquire at some point. So occasionally I check Better World Books, which stocks used books so their inventory changes all the time. I like to support that site. Getting used books suits me fine and I like the programs they have developed with the drop box program, literacy programs, etc. And they always have free shipping everywhere! 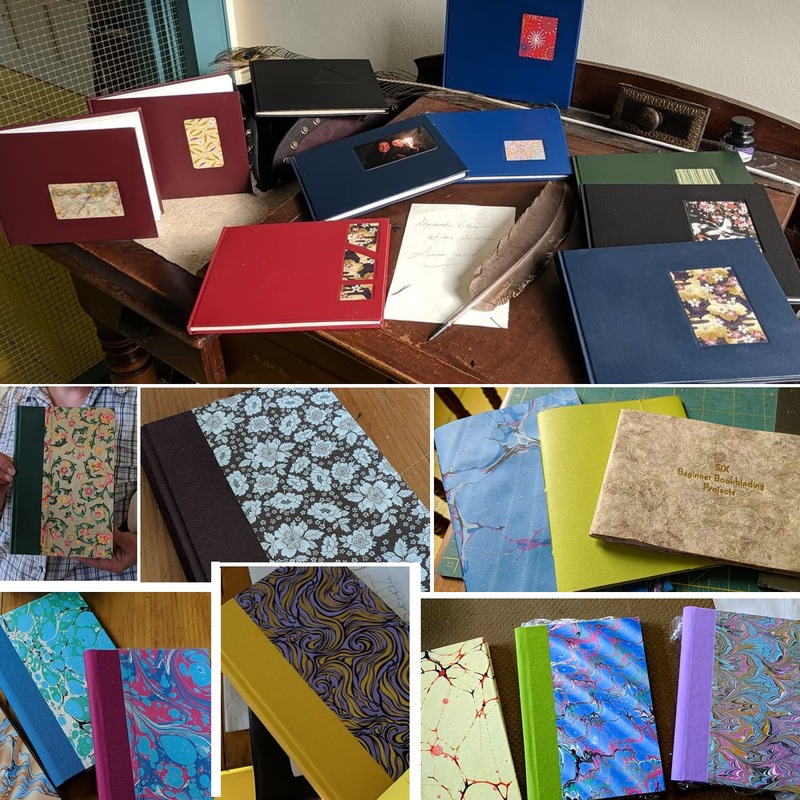 I came across several bookbinding books that are currently listed with decent low price tags -- these weren't the ones I was looking for so I thought I'd share them here in case any of you are looking for a new book. Happy New Year! I'm going to start off this year with a giveaway! 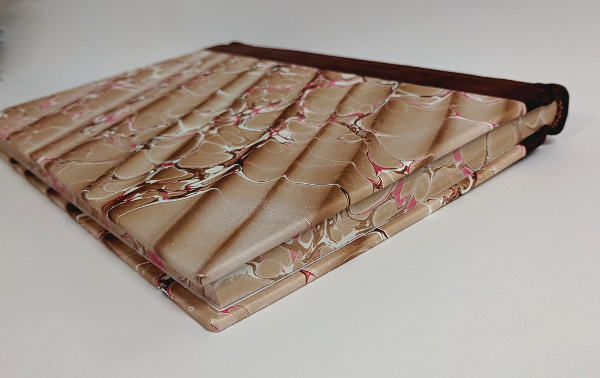 I made a batch of these hardcover 2018 weekly planners for the holiday market season last Fall. I have two left. I want to give them away while there is still time for them to be useful to someone. 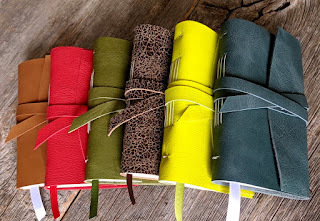 So, if you like this offline method of keeping track of your life, leave me a comment here to have your name entered into a draw to win one of them. I will draw two names on January 31st. You can also follow me on Twitter (@rhondamillerMHB) to get two entries into the draw. I will also collect entries on my Facebook page. The first name will get the beige planner, and the second name will get the teal & orange planner. These are handbound, hardcover books. 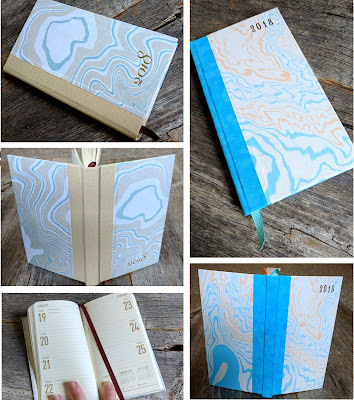 The cover features my own original Suminagashi marbling and the year printed in gold or silver foil. 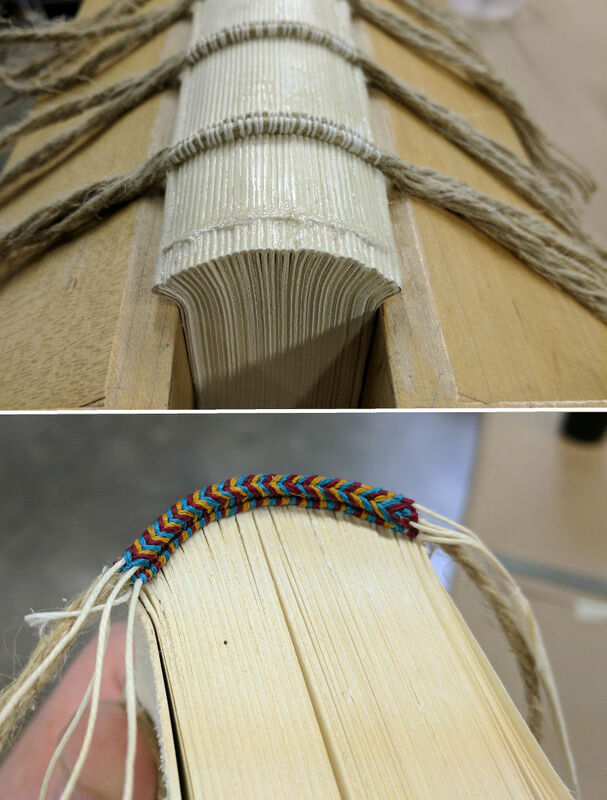 There is a ribbon bookmark and a two-page spread for every week. Book size is about 18cm x 10.5cm (or 7" x 4"). Comments are now closed. Winners will be announced shortly. 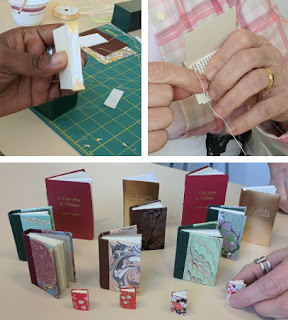 Another workshop that I did at PBI in May was on paper bindings, taught by Henry Hebert. 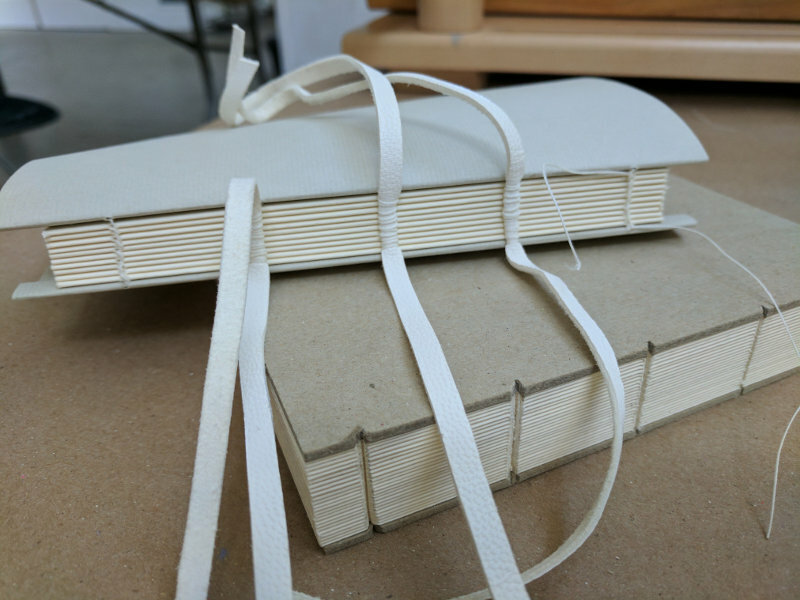 We made two different books, a stiff board case binding and a flexible laced paper case. 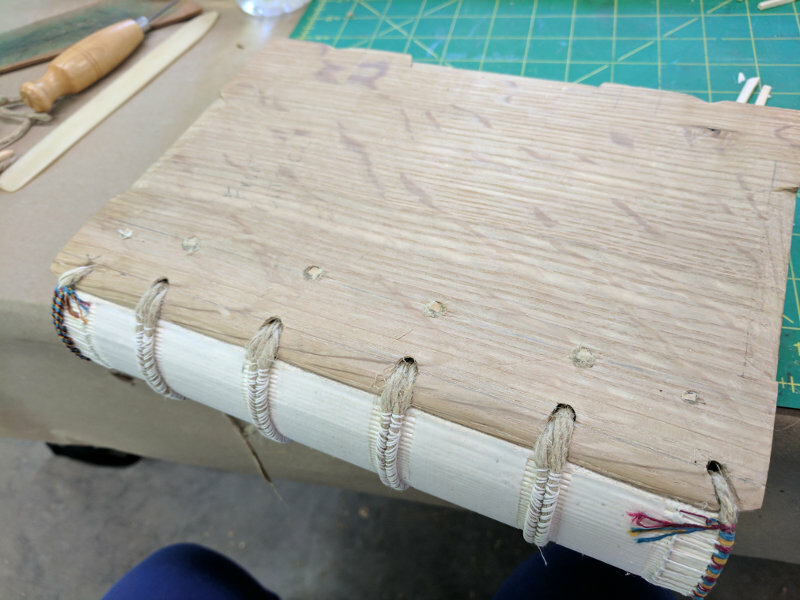 Although I have done similar bindings in the past, there is always something new to learn. 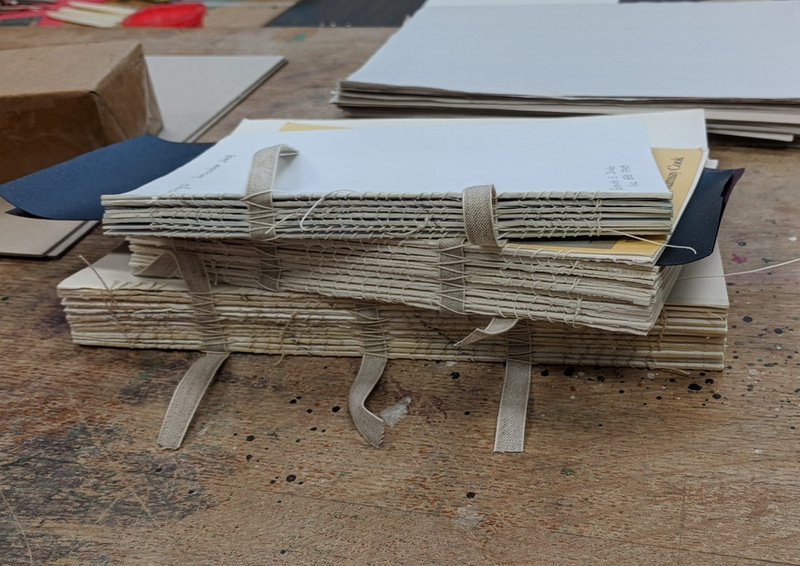 Henry is very knowledgeable about these bindings and had a lot to share about the mechanics and construction as well as the history and variations of them. The laced paper case was sewn on alum tawd thongs with a linen lining, with a basic bead-on-the-back endband. 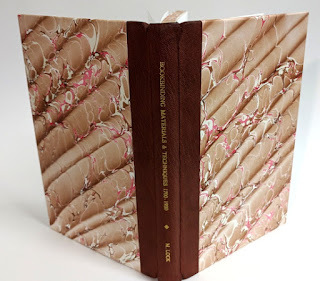 I used some awesome paper from Hook Pottery Paper for the cover. The stiff board binding was sewn onto recessed cords. 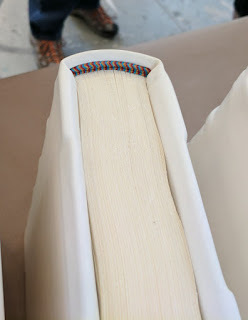 We made stuck-on endbands by oversewing onto linen and we made our own decorative paste papers for the covers. 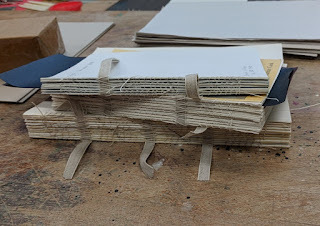 Well, traditionally the German paper bindings had rather drab paste papers on them actually - not very decorative, just serviceable really. So I went with drab. I have posted several photos related to this class on my facebook page if you want to see more. Henry has a blog where he has posted a lot about paper bindings in the past, and it is a great resource if you're interested in knowing more about them. Thanks for this great workshop, Henry! 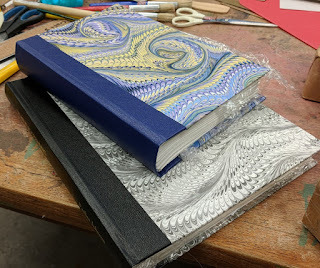 In May, I attended Paper and Book Intensive at Ox-Bow School of Art in Saugatuck, Michigan. It was very nice to be back, after having skipped the previous year! As always, each participant takes three courses at PBI so I will share here a bit about each of mine. The first one is "Sacred Books of the East" with instructor Jim Canary. I had never met Jim before, but his name is one of those that I have been hearing and reading about for a long time. Jim's class turned out to be one of my favorite classes ever. I learned a lot - because so much of the content in the class was new to me - and well, everything Jim said was just fascinating, so thanks, Jim! Jim travels and researches extensively in the Himalayan region so the quality of knowledge that he brings to the subject is extensive and also personal. We covered a lot in this class. We made two book structures: a palm leaf book with painted wooden covers, using real palm leaves for the pages; and, a sewn Tibetan structure that is historically very old, but practically unknown. 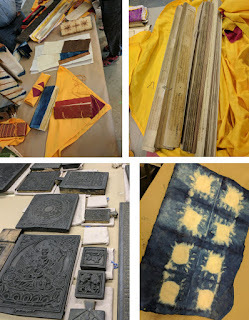 We also cooked up pots of indigo, safflower, walnut, and cutch for dying and we were able to do lots of experimentation with paper dying techniques and then incorporate some of those papers into our books. Jim also provided many Tibetan printing blocks that we were able to use. 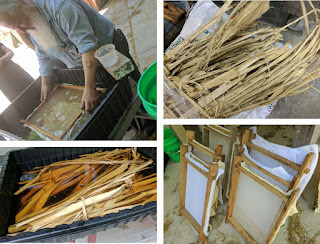 We also prepared fibers for making paper using traditional Nepalese techniques. The fiber was soaked and cooked and cleaned and beaten with mallets then we pulled sheets using the traditional pegged frames that Jim provided. All of that happened in just four half-day sessions. On top of all that practical work, Jim also shared many stories about his experiences in Tibet, related to books and paper and otherwise. A great way to spend four days! There are additional photos on my Facebook page.